Eventually you will raise your bleary eyes from your work in progress and ask the questions all writers ask: What day is it? What month is it? What year is it? Why doesn’t anyone ever pick up around here? We can help you with most of that and give your writing and planning a jump start too. Thirteen months of writing prompts – from the creative minds at Indies Unlimited. If you use these writing prompts each month, at the end of the year you’ll have thirteen short stories you can publish in your own eBook. Make sure to enter the weekly flash fiction competition online each Saturday morning on our web site at IndiesUnlimited.com for even more inspiration, and a chance to win a spotlight post with publication in the anthology at year-end. But wait—that’s not all! This 2013 personal planner is loaded with writing holidays, events and inspirations. You’ll also find handy worksheets for character profiles, chapter development, a worksheet to guide you through writing an effective book description and a checklist of common manuscript mistakes. Get yours today or you’re a total loser. Get 10% off the purchase price when you buy through Createspace. Just enter the discount code LW4EURAE. 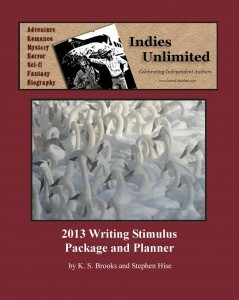 The Indies Unlimited 2013 Stimulus Package and Planner is available through Amazon US and Amazon UK. Will there be an Ebook for OS buyers? Awesome! I often wonder why no one picks up around here. Maybe if I put it on the calendar, it will happen!